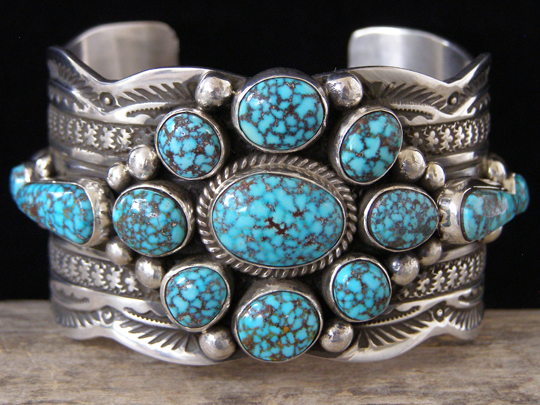 Guy Hoskie Kingman Turquoise Cluster Bracelet size 6 3/8"
We've been offering Guy Hoskie's work on our website since 2005. We have continued to accumulate his work which is always made with fine natural stones and exhibits his advanced skills as a silversmith. Stones: center 5/8" x 7/16"; 2 ovals 7/16" x 3/8"; 2 ovals 3/8" x 5/16"; 4 ovals 5/16" x 1/4"; 2 ovals 1/4" x 7/32"; 2 teardrops 5/8" x 1/4"